All Posts Tagged With: "Haircolor"
NEW Pureology Vinegar Hair Rinse, Available Now! Women are always looking for a gentle cleansing solution to enhance shine and leave haircolor vibrant. 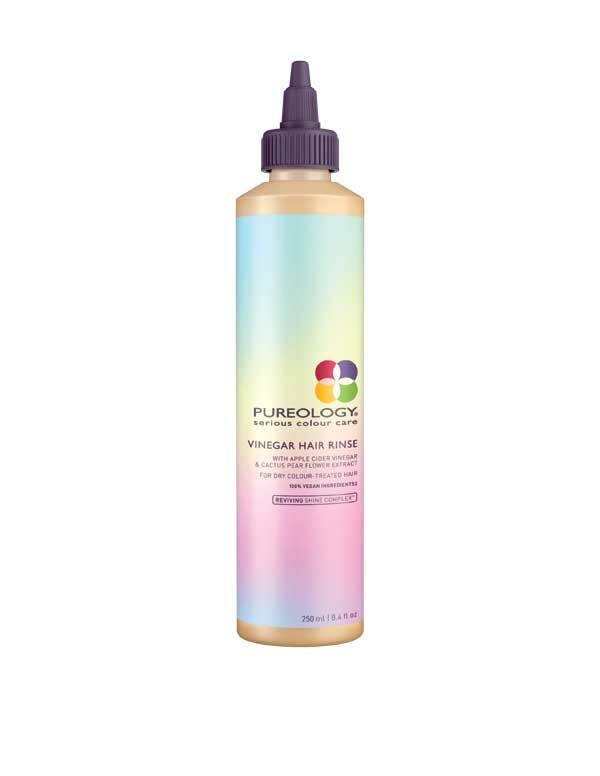 Pureology is excited to launch new Vinegar Hair Rinse, with its exclusive rebalancing formula featuring naturally derived apple cider vinegar and cactus pear flower extract for gentle cleansing and hydration, a balanced pH, and unbeatable shine. Coloring your hair shouldn’t be a scary thing. Whether you want to hide a few greys or go bold with a new vibrant haircolor, the process of dying your hair isn’t actually that alarming. Think of haircolor like makeup. For instance, like your go-to foundation, haircolor has the power to hide imperfections (read: greys, brassiness, and dull tones) and create a flawless base. Also, like your favorite eyeshadows and highlighters, haircolor can transform your look and illuminate your complexion. It’s a pretty cool thing! However, the transformative process of haircolor often gets lost behind claims of damage and breakage. With all of these unchecked assumptions out there, it’s no wonder that some are a little weary of how haircolor can affect their strands. To help clear up the confusion, Global Redken Artist Sean Godard weighs in on some of the web’s most popular haircolor theories to set the record straight. Sean Godard: Fiction! Colored hair has more shine and condition compared to uncolored strands. This is especially true if a client has had a Shades EQ Gloss service. Generally, the only color that will make your hair feel dry and brittle is when using a lightener to strip the color. Last night, April 26, 2011, Blake Lively showed up to the Time 100 Gala in New York City with a new strawberry red hair color. Miss Lively as a redhead? Do you love? 1. 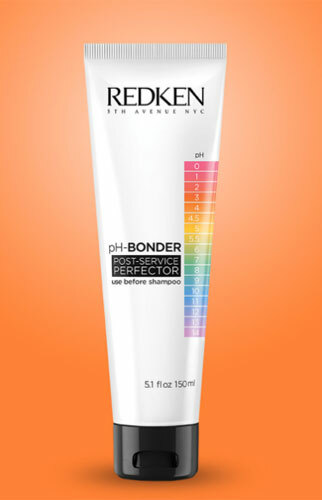 Redken Color Fusion (5NN) on the base: Color Fusion Advanced Performance Color Cream delivers healthy-looking, multi-dimensional haircolor and features Redken’s exclusive Colorbond Technology to provide optimum durability, condition and shine. Beyoncé’s New L’Oreal Paris “Feria” Commercial 2011. Watch. Drew Barrymore is looking better than ever these days and I attribute it all to her long hair. It makes a huge difference! Well, her October 2010 Harper’s Bazaar cover is no exception. Marta Walsh has the scoop on how to get Drew Barrymore’s haircolor on the cover of Harper’s Bazaar Cover October 2010! Tracey Cunningham, Redken Creative Consultant for Color created the popular, rooty look so perfect for Drew and anyone else with that fun, flirty personality. Hair color: How to go blonde from brown hair. Kim V0, master colorist to Hollywood’s most elite, took Katherine Heigl back to the Golden Era of Hollywood, creating at her request “a buttery, creamy golden blonde reminiscent of old Hollywood Glamour. ” Here’s how he achieved her look— which she loved!— at his eponymous salon at the Montage Beverly Hills this past week using Kim Vo Luxury Haircare. Clairol’s Perfect 10 has launched their partnership with Jill Stuart during Jill’s Spring 2011 show. Clairol Color Director, Marie Robinson colored 5 models with Perfect 10, working closely with Jill to stay true to her vision for the show. Four of the models were their “runway to real-way” girls who represented Jill’s and Marie’s fashion and hair color inspiration for Spring 2011. Red Carpet Hair Color. Prior to walking to red carpet at the 2010 Primetime Emmy Awards this Sunday, August 29, celebs attended a two-day star studded beauty haven at the Byron & Tracey Salon in Beverly Hills. Attendees received complimentary haircuts, blowouts, Redken color services among other pampering treatments. Tracey Cunningham, Redken Creative Consultant for Color, prepped Leslie Mann, Marly Shelton, Emma Stone, Anne Heche, Eva Amurri, Hilary Duff among many others.